As we approach November in an especially sensational Presidential race, Proofpoint researchers have seen a variety of election-themed emails – everything from straightforward text-based spam with embedded links to credential phishing. 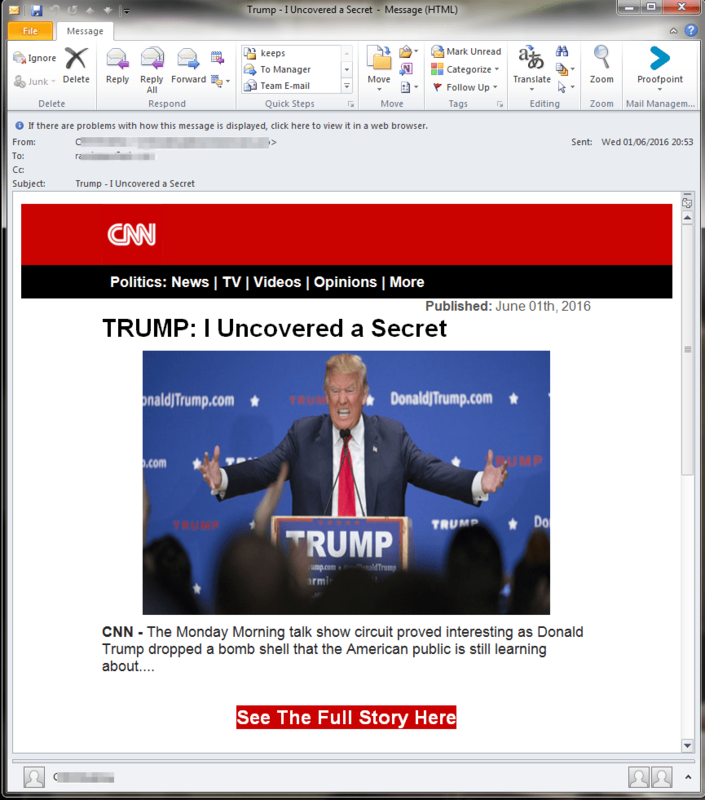 In terms of our themes, our spam samples skew heavily towards lures featuring Donald Trump. The Republican nominee appears in nearly 169 times as many messages as those featuring his Democratic opponent, Hillary Clinton. 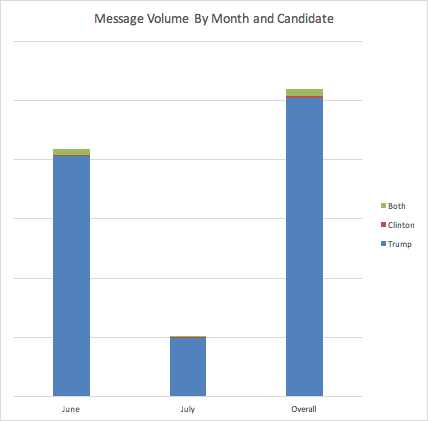 We scanned subject lines in spam messages detected across our customer base in June and July for occurrences of “clinton” or “trump” and observed a disproportionate number featuring only “trump.” Figure 1 shows the relative volumes of messages mentioning one or both candidates in the message Subject in June. Overall, Trump appeared over 270 times more often in June than Clinton alone and 34 times as often as either Clinton or both candidates. “Get rich / smart like Trump”: These sometimes included subtitles such as “Wall Street is outraged” and similar messages with fake sending aliases that appeared to come from consumer finance publications like “CNN Money”. 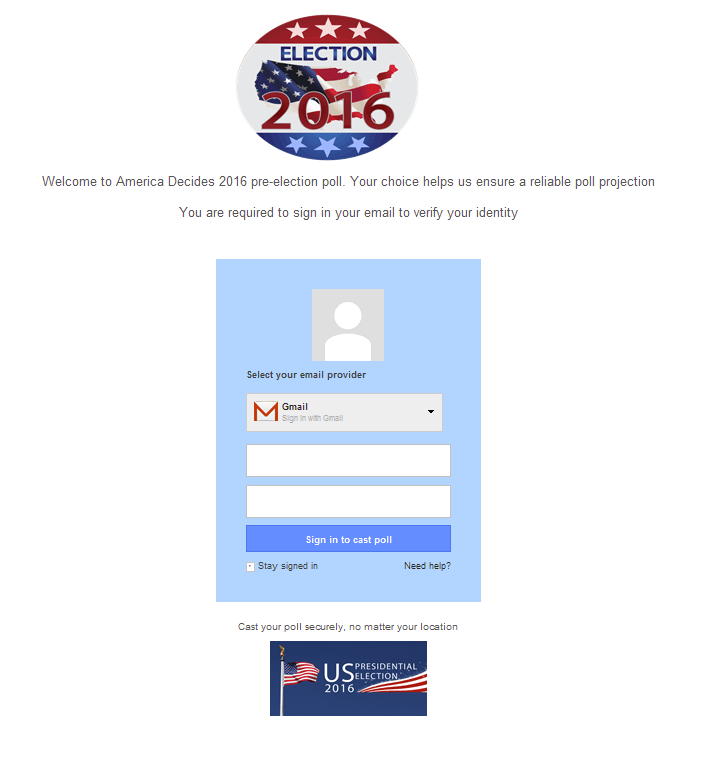 We also observed an election-related credential phishing attempt that enticed users to log in to Gmail to “verify their identity” in order to participate in a voter poll (Fig. 6). However, to date this has not been a common tactic. 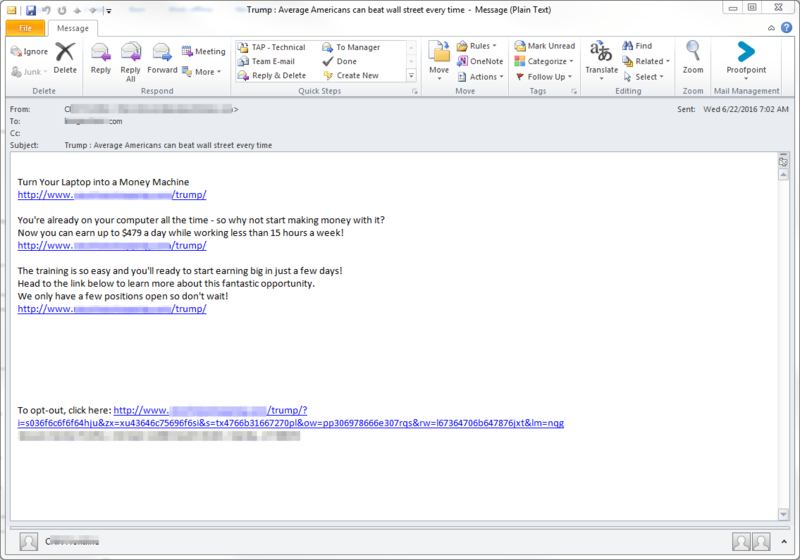 Instead, more traditional lures to click through to work-from-home sites and common spam targets appeared much more frequently.